Dimensions 1.25 by 9.50 by 7.75 in. âPhillipsâs book is a powerful tool for anyone who wants to make a career for him- or herself within the world of transmedia. Through her guidance, the reader is able to understand the fundamentals of transmedia and the power it can have when used with a compelling and strong story." Itâs the buzzword for a new generationâa revolutionary technique for telling stories across multiple media platforms and formatsâand itâs rapidly becoming the go-to strategy for a wide variety of businesses. If you work in marketing, entertaining, or advertising, transmedia storytelling is a must-have tool for pulling people into your world. Why do you need A Creatorâs Guide to Transmedia Storytelling? If you want to attract, engage, and captivate your audience, you need this book. Written by an award-winning transmedia creator and renowned games designer, this book shows you how to utilize the same marketing tools used by heavy-hitters such as HBO, Disney, Ford, and Sony Picturesâat a fraction of the cost. With these proven media-ready strategies, youâll learn how to generate must-read content, must-see videos, and must-visit websites that will only grow bigger as viewers respond, contribute, and spread the word. Youâll create major buzz with structures such as alternate reality games and fictional character sitesâor even âold-fashionedâ platforms such as email and phone calls. The more you connect to your audience and the more you get them involved in the storytelling process, the more successful you will be. This isnât the future. This is now. This is how you tell your story, touch your audience, and take your game to the next levelâthrough transmedia storytelling. 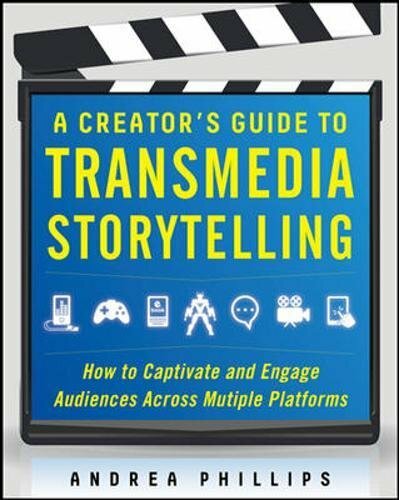 About: The First How-To Strategy Guide to Transmedia Storytelling “Phillips’s book is a powerful tool for anyone who wants to make a career for him- or herself within the world of transmedia.